Sold out. Contact me if you would like one the next time I make them. Finally, a Cube a Libre for everyone. For years we have been asked to create a practical and less expensive version of this effect that anybody can use. In the past Cube a Libres have been big, expensive, and complicated. The large blocks are sized for stage and are just bigger than many need, plus the large blocks are too big for smaller hands. 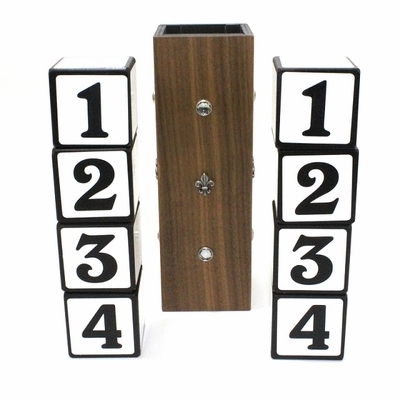 In my new version, the mini 2 inch blocks are perfect for performing from 5 to 50 plus feet. Their small size also makes it a breeze to carry, handle, and set up. With only 4 blocks per stack the routines are much easier to remember and the blocks stack effortlessly. 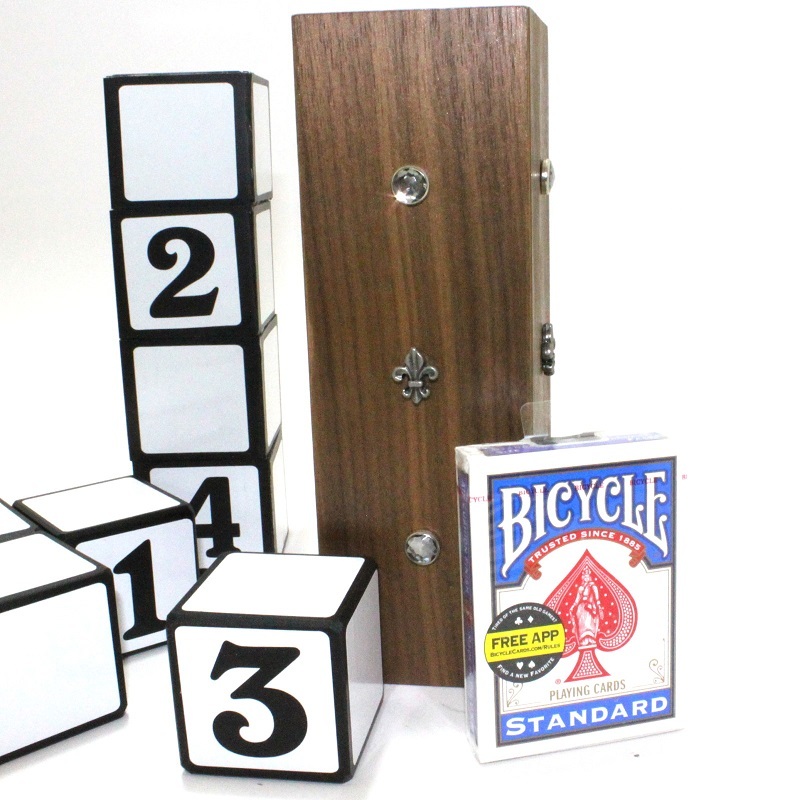 You can do almost any Cube a Libre routine out there with this set, but we are including our original Cube a Libre routine as well as a routine for the Bewildering Blocks which uses only 4 of the blocks for a streamlined version of this baffling effect. So you get 2 effects in one! EFFECT #1: Cube a Libre. Two stacks of blocks, fully inspectable, each stack of blocks is numbered one through four. Rearrange the blocks from one stack, place the column over the second stack for a split second and when the column is removed the number order of the second stack matches the first exactly. The performer puts it through its paces by turning the blocks sideways, backwards, upside down--but the second stack of blocks always matches the first. For a finale, the spectator chooses whichever way they would like the blocks to be stacked. EFFECT #2: Bewildering Blocks. One stack of cubes is re-stacked in several combinations but instantly returns to order when the tube is removed. For the final phase the blocks end up all turned upside down. Very easy to learn and perform. 1 walnut tube finished in the old style way Gimpy’s is known for. The mechanism is self-contained, easy to use, and there is no hole to worry about being seen. 4 gimmicks that are precision made, velvet lined, and handle like a dream. Built to last. This is even better than Gimpy’s fabulous Demi Cube. I’ve owned a number of Cube-a-Libre’s over the years. The biggest problem with the basic trick is there are just too many blocks which takes a long time to perform and gets too confusing for the spectators to follow. Harries’ solution to the problem was to just have one set of 4 blocks with their Crazy Cubes. That was a great approach but the blocks were still pretty large. Gimpy himself also has a wonderful other item with just three cubes called Demi Cube which is also a beauty. But I think what Gimpy has done with his Mini Cube-A-Libra is perfect! 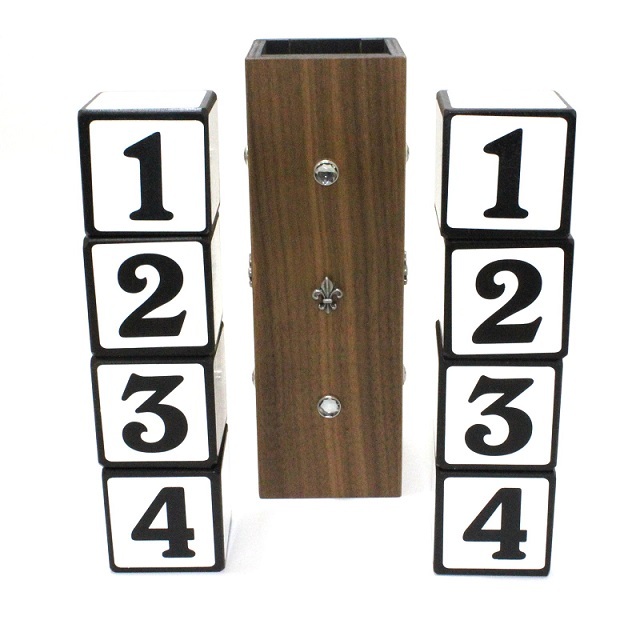 Firstly, they are made perfectly and the size of the tower is just 9″ high, with each cube 2″x2″ – a very manageable size. 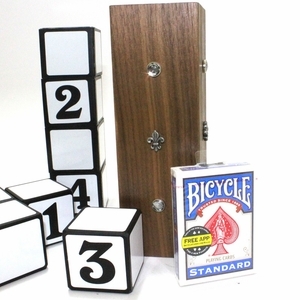 The blocks and tube are made of wood and the gimmicks are made of aluminum. The gimmick to control the blocks is cleverly concealed in the exterior decoration of the tube and on a simple glance you could easily see all sides of the tube without spotting anything. There are no holes to cover up and hide. Secondly, there are only four cubes in each stack – this is easier to follow, still very magical, and easier to learn and perform. Finally, the tube is created in such away that you turn the tube upside down and the gimmicks will not fall out so you can handle the tube even more freely. Thanks Gimpy! Good to see you still in action and producing amazing magic!